New Delhi, March 20: Premium smartphone maker Huawei on Wednesday said it would launch its foldable 5G smartphone 'Mate X' in India in 2019. According to the smartphone player, Mate X would be launched by mid-year and considering India as an important market, it would be introduced here soon after. 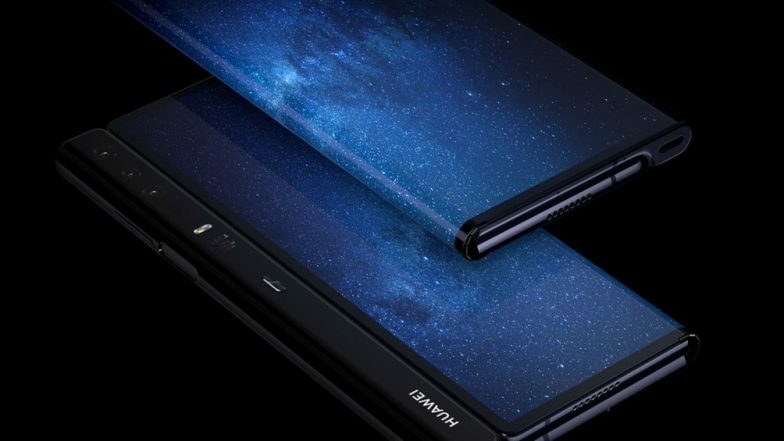 However, the company had said at the Mobile World Congress 2019 (MWC) in Barcelona that the foldable device's availability would depend on the 5G network in the country. Huawei Smartphones & Laptops Will Run on Its Newly Developed Operating System To Combat Any Potential Ban on Android & Windows. As Huawei's first 5G smartphone, the Mate X runs on the Balong 5000 chipset, which is the world's first multi-mode 5G processor with 7nm process and thus supports 2G, 3G, 4G and 5G with a single chip. New Apple AirPods Gets H1 Chip, Wireless Charging Case, Hey Siri Support & Long Battery Life. With its "Falcon Wing Mechanical" hinge, when unfolded, the 6.6-inch dual display panel transforms into an 8-inch tablet that is only 5.4-mm thick. It features a high-capacity 4500mAh battery supporting the world's fastest 55W "HUAWEI SuperCharge". In just 30 minutes, the technology can charge the battery to 85 per cent.